Caravanners with young families demand more flexibility from their vans on their caravan holidays: options for lots of kids, or for bringing guests on holiday. This has led to tourers such as the Xplore 526 from the Explorer Group. The entry-level brand was introduced in 2008, and for 2015 it takes the range up to six models with the demise of the four-berth 530 and the return of the double-lounge 434. The rakish front panel and sporty graphics of these affordable caravans give a fresh look – and lots of tweaks have made them more usable. The Xplore 526 is built on an Al-Ko chassis, as is the rest of the brand and the other line-ups in the Explorer Group – except for Buccaneer. The reviewers from Practical Caravan also report that another family feature being used in the entry-level range is SoLiD construction – an impressive performer in our Owner Satisfaction Awards – refined with ‘Strong-Lite’ one-piece aluminium sides and a ‘no-screws’ bonded awning rail. The two-cylinder front gas locker has been enlarged, and in front of it the hitch cover now features steps to make it easier to clean the front of the caravan. The front lounge of the Xplore 526 feels modern and surprisingly bright, given that there’s no sunroof. That’s largely thanks to the big one-piece front window, the pale upholstery and the ‘Aspley Walnut’ timber effect. Lighting is by LEDs and there are plenty of 230V sockets, while swapping a space-eating front chest for a flip-up occasional table gives a roomy feel. The freestanding lounge table is sited just aft of the offside sofa. If that’s not enough space for you, there’s a three-seater rear dinette on the nearside of the van – an ideal play area for children during the day. Our only complaint is that the overall feel is a bit bland, although it is lifted by the attractive curtains and cushions of the Verve trim. The kitchen in the Xplore 526 has a combined oven and grill, which is expected at this price point. The three-burner gas hob is well laid-out, but it's right by the main entrance and we’d like to see a barrier to prevent people from touching the hob as they enter the caravan. The Xplore 526's centre washroom is ideal, considering the likely footfall. You can access it from any one of the six berths without disturbing your fellow residents. However, it does mean the washroom feels a little squeezed, with the shower set over a small offset corner sink and not in a lined cubicle. A Rapid-Heat Whale eight-litre water heater will please those who shower on board. A Whale Intelligent Controller turns off the water when the tank runs dry to avoid damaging the pump. The main selling point of the Xplore 526 is its sleeping accommodation, according to the Practical Caravan review team. The front lounge converts into a generous double bed, although the sofas are a bit short as single beds, and at the rear are four berths that can be separated from the living area by a pull-out screen. On the offside are two fixed bunks. The dinette opposite can be converted into another pair of bunks by lowering the table to make a base for the lower bed. For the upper bunk, safety boards simply fold out instead of fitting into fiddly slots. The bunks and sofas have Ozio mattresses, used in all Explorer Group vans for 2015; the manufacturer claims they'll last as long as the tourer. The Xplore 526 boasts a 198kg payload with an option to extend it to 231kg. There’s a large wardrobe above the fridge on the offside, along with plenty of overhead lockers and under-bunk stores. The interior of this caravan feels really sturdy, with dovetail joins to the drawers and positive catches for the overhead lockers – a bonus in a budget model. 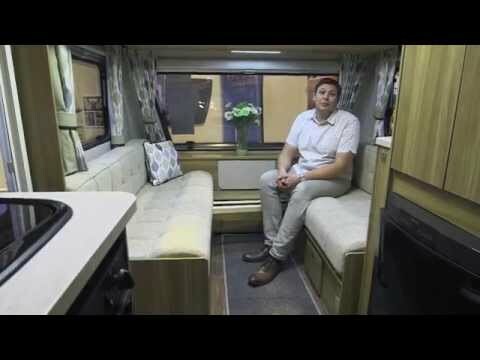 Practical Caravan's expert reviewers were impressed by the new 2015 Xplore 526. As a lightweight van for a family of four, it works superbly well, offering additional berths when needed. It also succeeds in being affordable without a bargain-basement feel to the interior, retaining the same sense of quality as its more expensive siblings.